How do you know a Kickstarter is worth checking out? When a friend messages you to point it out. 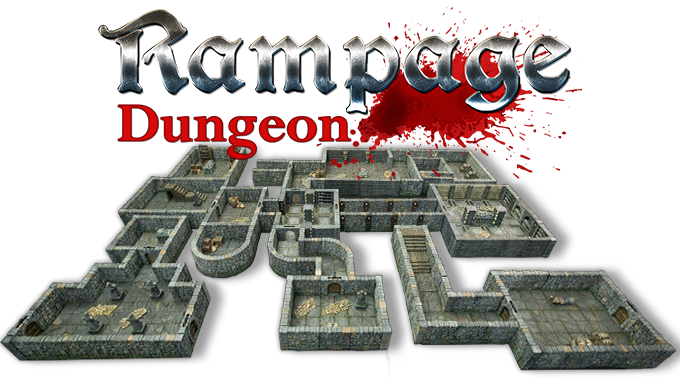 In the case of Rampage Dungeon, that someone was my editor at the Open Gaming Network, Kim Frandsen, so not only was it fun to look at, it also meant I had another assignment. What came of it is a discussion about dungeons, locks, and how good Lester Bursley’s paints are so read on. EGG EMBRY: Thanks for taking the time to talk dungeons with me. Can I ask you for the brief overview of Rampage Dungeon? JAMISON VALERIO: Of course, thanks for the interview and time as well. 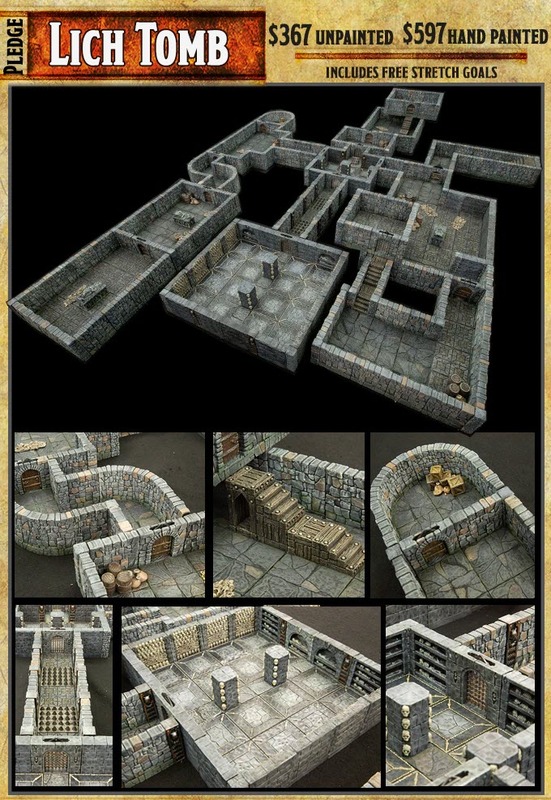 Rampage Dungeon is an interlocking dungeon system, built around the OpenLOCK locking standard created by Printable Scenery. You can build multi-level rooms and hallways that are all locked together, so they can be moved around and dropped on the table as the players advance in a game. This way you do not need to have your whole build sitting on the table when your players arrive. This leaves a lot more mystery in the game, the way it was originally meant to be played with a pen and grid. It’s built around the 1” grid making every part of our floor tiles a playable space for miniatures. Rampage is also fantastic for people that like to make large diorama type builds. Because everything locks together, you can build elaborate layouts and not worry about it getting knocked over or moved out of place. EGG: These pieces will be injection molded and hand painted, all in the United States. What made manufacturing them more appealing than producing these products in another country? JAMISON: We really went back and forth with this one for a while. We have already worked with a company in China that did a fantastic job and made the process of making our prototype tiles smooth. We just wanted to have a bit more control of our product with the final release. It’s probably because we come from the 3D printing background where we are used to printing and manufacturing the models ourselves, it just felt right to make it locally where we could be more engaged with the process. As for the painting, we were always going to have them painted in-house because that’s part of our hobby and we wanted it 100% right. 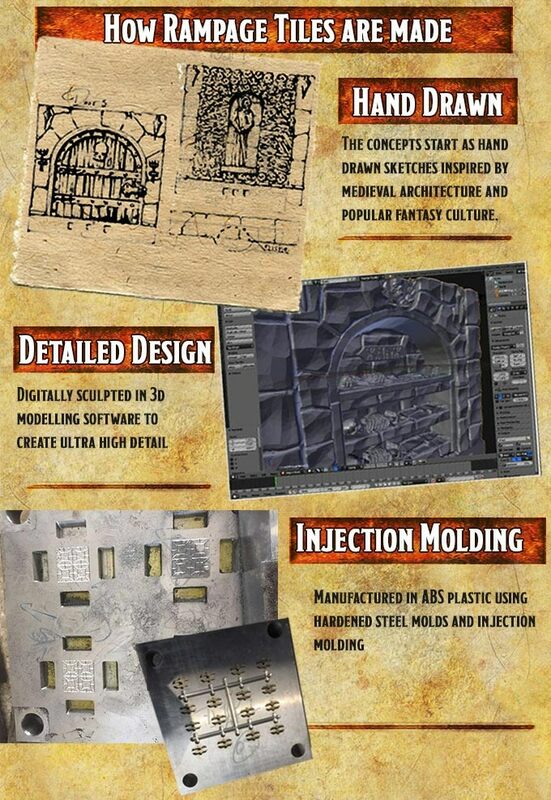 EGG: Are there any plans to offer STL files for these pieces to let fans print their own? Or will these only be available through this campaign? 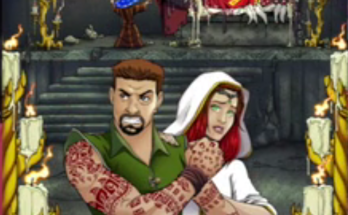 JAMISON: Not through AoD [Architects of Destruction] currently. We created AoD to be a physical product manufacture. Things could change down the road, but right now our focus is creating a finished polished product for gamers. EGG: Optionally, these rewards can be hand-painted by a team headed by Lester Bursley. For those that have not seen his work, tell me about Lester and why he’s a good fit for this Rampage Dungeon? JAMISON: Yes, Lester is amazing! I have been a fan of his for many years. He painted some minis for me, and from there we just hit it off. When we started to work on Rampage as a product I knew getting input from Les was the right thing to do. He was into it right away and has been a great help. EGG: Rampage Dungeon is not out yet and it’s already won an award. Tell us about the award and why you feel your product won. 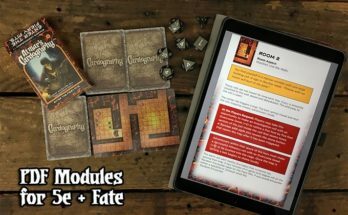 JAMISON: Yes, Rampage, for those who are not familiar with it, has been out for a few years now as a 3D printable product from Printable Scenery. Matt Barker and his team won an award for the design and interlocking of the system. Rampage was a unique entry at the 2017 International A’design Awards in Europe and won Silver. 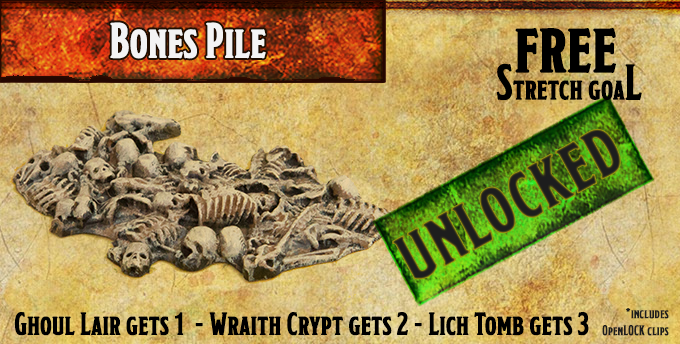 EGG: As you’re unlocking stretch goals, some of them are additional pieces included with the sets. So far, there are two wooden doors, a stone archway, two different kinds of stone floor pieces (one to be unlocked soon), and a pile of bones (that look great in the picture, I might add). 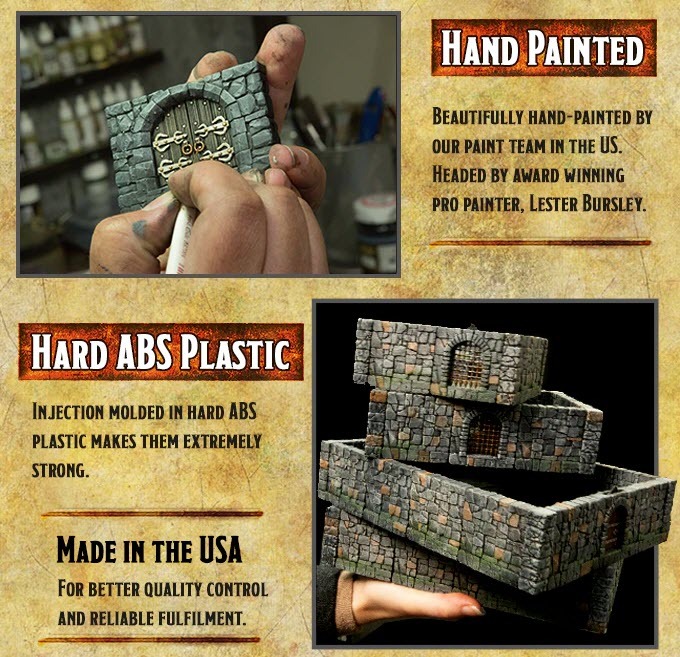 Are these intended more as scene accents or do you foresee having enough free pieces in, say, The Lich Tomb pledge level to assemble an additional room? JAMISON: The free stretch goals will be décor pieces and some fundamental and advanced building pieces. Because OpenLOCK is such a robust system, there are many different pieces that help with unique builds. So, with the stretch goals we wanted to provide some of those pieces, like the S Floor that allows you to build 5’ hallways. EGG: What piece, or pieces, do you feel are going to blow away GMs and players when they see them at their gaming table? JAMISON: Personally, I really love the broken ground water tiles that you see in the main video. It allows builders to make large pools or long thin corridors of cracked ground pools running through their dungeons. I think for DMs and players that have never used Rampage or OpenLOCK before they will be blown away by the most fundamental part of the product, the locking! There is nothing on the market like this, you can move rooms around and drop them on the table as needed. Because of that, you can stack level after level at any size build you want. It also lets you play vertically, by dropping between floors through hatchways and wells. EGG: You worked with Printable Scenery, and your pieces are compatible with theirs through the OpenLOCK Clips. How much is Printable Scenery involved in this? What combination of your work and theirs are you most eager to play in? We are looking forward to fulfilling this first Kickstarter promptly so that we can launch our follow up release. EGG: Thanks for talking 3D dungeons with me. For those interested in this Kickstarter and your work, where can they find you? Egg Embry, Wanna-lancer™, wrote comic book short stories, edited comic book series, wrote and drew a webcomic, and contributed to comic book journalism across the 2000s. 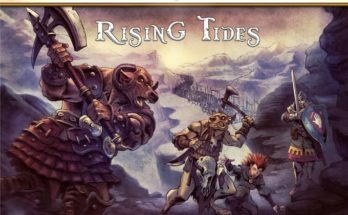 With the advent of Kickstarter, and the resurgence in his love of role-playing, he bought a series of writing opportunities in tabletop role-playing games in the tradition of vanity press. Now he freelances for EN World, Open Gaming Network, and Tessera Guild, and writes for a variety of game publishers.